To make the overall tasks and operations of the school smooth, effective, and less hectic; connecting to a prominent school management software is the best option available. Not only it can help you to organize different task, but it also lets you save your money too. According to Wikipedia, School Management Software is a type of student information system which is widely used in UK schools, claiming over 80% market share across the primary and secondary sectors. Another important feature is that it helps the school administration to regulate different activities; whether it is related to activities of the school, teachers, students, etc. It works as a glue and binds the different stakeholder perspectives together and make sure that everything goes as per the plan. 1. Supports user-friendly designed dashboard, making it super easy to manage different tasks together in the limited time frame. 2. Saves time, money and energy as it is the fastest and easiest platform which support full security. 3. Covers a number of tasks like student enrolling, recording and analyzing different activities, reminders for the upcoming events, salary calculation, generating examination report, issuing books status, adding or removing events, income/expense invoices measurements, and even more including the management of grade reports. The head of the school or the principle is the one who regulates all the school functions. From organizing the entire staff and students to assigning duties and responsibilities, there are a number of the little-little task which needs to be concerned. So an exceptional system can help you bring all the stuff together effectively. 1. Not only that, this powerful system can help you eliminate printing and paper costs and help you manage grade reports, attendance, timetabling, donation management, and more. 2. On the part of students, you can keep an eye on the stuff like student enrolling, customized admission forms, management of complete admission process, student fee records, etc. 3. On the part of teachers, it helps the principle to regulate functions like maintain salary structure and its payment, generate PaySlip, etc. 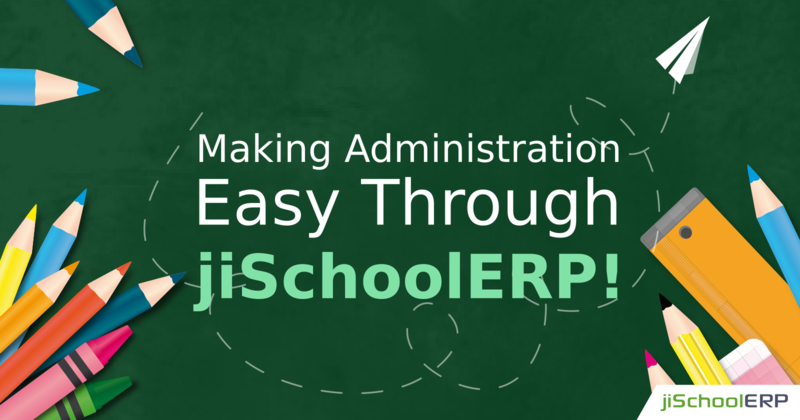 Summing up, with the help of an effective school management software like jiSchoolErp, it becomes easier for the administration department and the principle to cover all the important operations whether it is in concern with the students, teachers, or other areas like IT staff or bursars. This helps you to remain in touch with the overall activities pertaining to the school.